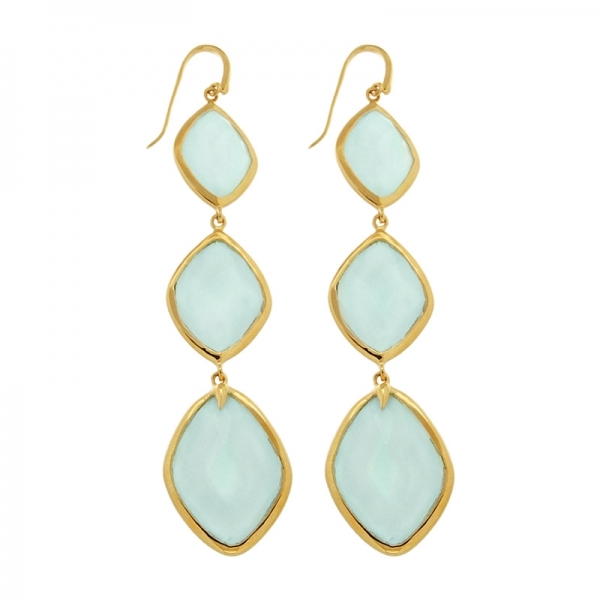 From the stunning ‘Maiya’ collection these 3-tiered drop aqua chalcedony cocktail earrings ooze sophistication. 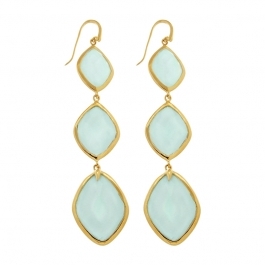 The varying sized diamond shaped gemstones are perfectly encased in 18k gold vermeil. Beautifully faceted; they are lightweight and comfortable to wear and feature the same design on the back as on the front. Approx drop: 7.5cm. Each piece is hallmarked and comes beautifully packaged in the designers own exquisite packaging. Missoma brings you a stunning collection of exclusive and innovative designer jewellery in a variety of bold and colourful designs that are always stylish and effortlessly elegant. Award-winning Missoma jewellery is available in 18ct gold vermeil and Sterling Silver, both with an array of exotic semi-precious gemstones with attention to detail and craftsmanship. Missoma has attracted a loyal and ever-growing fan-base in the UK and abroad. It has also become a firm favourite with leading fashion publications such as Harper’s Bazaar, Elle, Grazia, InStyle, Glamour and many more. Missoma is quickly becoming one of the hottest names in UK Designer Jewellery. Joots.co.uk is an official UK stockist of Missoma jewellery.